Модуль, позволяющий генерировать последовательности управляющих сигналов CV/Gate — обычно эти последовательности могут содержать от 8 до 32 шагов. Секвенсор может запускаться управляющим сигналом или вручную. As a source, depending upon the configuration, it may produce a sequence of voltages, usually set by adjusting values on front panel knobs. 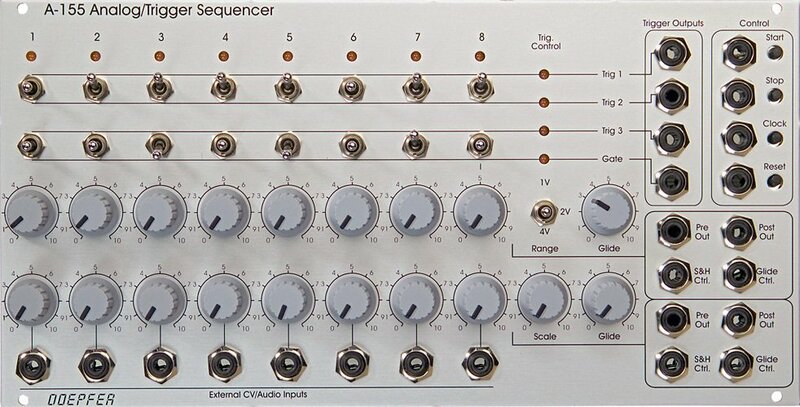 The sequencer may also output a trigger, and/or gate, at each step (stage). Sequencers are stepped by a trigger being applied to the trigger input. Designs may allow for stepping forwards or backwards, oscillating patterns, random order, or only using a limited number of stages. Mixer - a module that adds voltages. RM - Ring modulator - Two audio inputs are utilized to create sum and difference frequencies while suppressing the original signals. Also called a four-quadrant multiplier or balanced modulator. S&H - Sample and hold, is usually used as a control-voltage processor. Depending upon the design, usually an ascending edge (trigger), captures the value of the voltage at the input, and outputs this voltage until the trigger input reads another voltage and repeats the process. 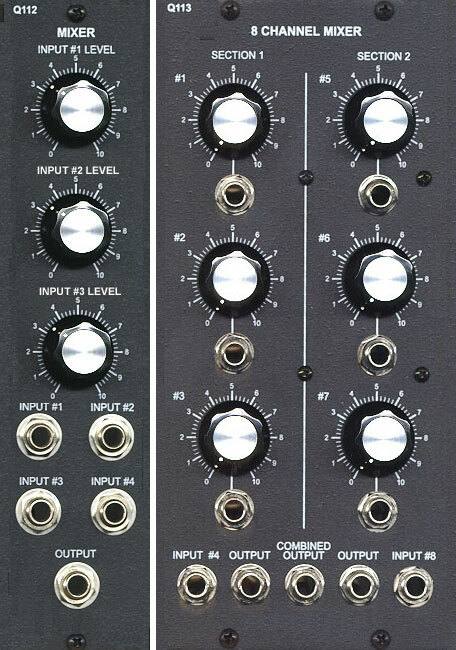 Custom Control Inputs - It is possible to connect any kind of voltage to a modular synthesizer as long as it remains in the usable voltage range of the instrument, usually -15V to +15V. LPG - Low Pass Gate, is a compound module, similar to a VCA and a VCF, except that the circuit uses a Resistive_opto-isolator (vactrol) to respond to the control voltage, which also filters the sound as it amplifies, allowing more high frequency information through at higher amplifications. Slew limiter - is usually a sub-audio lowpass filter. When used in a control voltage path to an oscillator, this can be used to create glide or portamento between frequencies.